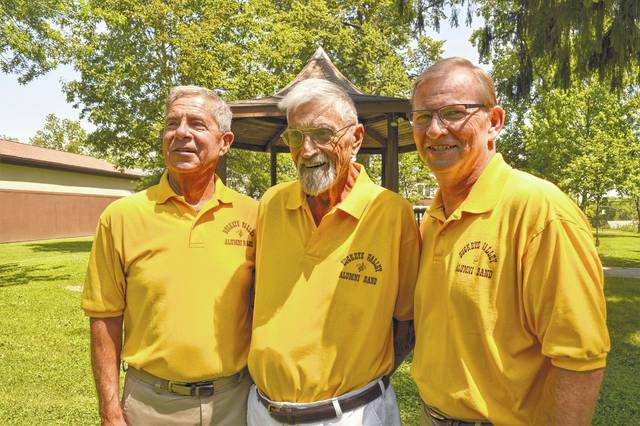 From left, Tom Kaelber, Bill Everhart, and Kent Eastham will participate with the 30-member Buckeye Valley Alumni Band on Sunday to kick off the “Harmony in the Park” concert series. The performance begins at 7 p.m. Sunday at Bicentennial Park on Washington Street. • Powell Paint Night, Powell Branch, 6 p.m., Friday. Canvas Creations for You will be at the library to provide a step-by-step guide to painting with an instructor. To be added to the waiting list, visit www.delawarelibrary.org/event/powell-paint-night. • Main Street Delaware Farmers’ Market, downtown, 9:30 a.m. to 12:30 p.m., Saturday. The market offers an array of seasonal fresh produce, baked goods, live and cut flowers and plants, and craft items. Income-eligible senior citizens can get vouchers for farmers’ market foods from SourcePoint. • Military Family Free Dayz at the Columbus Zoo & Aquarium, 4850 Powell Road, Powell, 9 a.m. to 7 p.m., Saturday to July 7. Members of the military and their immediate family are offered free admission to the zoo and discounted admission to Zoombezi Bay waterpark. Military ID or proof of service is required. Transformers: The Last Knight (PG-13), 2 p.m., 5 p.m., 8 p.m.
Cars 3 (G), 2:15 p.m., 5:15 p.m., 8:15 p.m.
Despicable Me 3 (PG), 2:30 p.m., 5:30 p.m., 8:30 p.m.
Transformers: The Last Knight (PG-13), 1 p.m., 4 p.m., 7 p.m.
Cars 3 (G), 1:15 p.m., 4:15 p.m., 7:15 p.m.
Despicable Me 3 (PG), 1:30 p.m., 4:30 p.m., 7:30 p.m.
Bill Everhart will direct the Buckeye Valley Alumni Band’s hour-long performance to kick off the Harmony in the Park concert series on Sunday. But the 85-year-old band director could continue for another hour like he normally does on any other Sunday when the band typically rehearses. Everhart has directed the band for the majority of the its 33-year history and continues to do so despite a spate of health issues over the past year. Everhart worked as a band teacher at Buckeye Valley Local Schools for 17 years from the 1970s to 1980s. He later joined the alumni band as its director after it became established for about five years. “It’s been a hoot,” he said. The alumni band’s membership will need new young members in the long term to maintain its viability. Kaelber said a connection with Buckeye Valley is preferred, but anyone is invited. He said that a long-running joke is that anyone can join the band if they’ve even only heard about Buckeye Valley schools. Kaelber and Kent Eastham, another retired Buckeye Valley band director, will perform with the 30-member band, playing the baritone horn and clarinet, respectively, from 7 to 8 p.m. at Bicentennial Park on Washington Street. The band will play a repertoire of American music including patriotic melodies. “It’s been a long-standing tradition for the Buckeye Valley Alumni Band to open the Harmony in the Parks concert series,” Kaelber said. Eastham said it’s the epitome of small-town America. The concert series caters to an older audience, but the 3-acre park becomes filled with concert goers and their blankets and lawn chairs. Eastham expects more families to attend in the near future. “It’s a perfect way to end a weekend,” Kaelber said. In case of rain, concerts may be moved to the Delaware Community Center YMCA, 1121 S. Houk Road, which organizes the series. “Harmony in the Park is a Delaware tradition. It’s a wonderful way to end the weekend, enjoying our beautiful parks and listening to great music,” said Roger Hanafin, the Delaware YMCA’s youth, teen and family program director. • Aug. 20 — Ice Cream Social, Delaware County Concert Band at 5:30 p.m., 3 of a Kind, 6:30 to 7 p.m.
Sponsors of the concert series are Jessica Forman of State Farm, Amanda Mowry of Modern Woodmen, Dental Essence, Wendy’s, Domtar, Kona Ice, Foot & Ankle Wellness Center, J&J Mobility, Snyder-Rodmen Funeral Center, Haller Wealth Management Group, Hiram Masonic Lodge No. 18, Eagles No. 376, Delaware County Kiwanis. Evening Club, PPG Industries, Delaware Area Eye Care, Hilborn Insurance, Fidelity Federal Savings & Loan, Trimble Insurance Agency, Compucheck Tax Service, Mail Pro 1 Printing, Dominotes, and Willow Brook Christian Community.